Code Name Verity is AMAZING!! It's been a stellar reading year so far, quality-wise at least. Looking back over the past 5 months, throwing out rereads, I've rated 12 books as a 6 and 8 books as a 7. That's pretty good for me; the same time period last year gave me 8 6's and just a single 7. This one blows them all away. 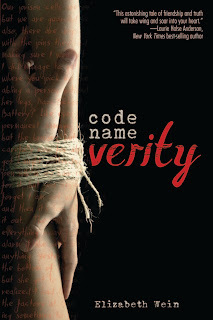 Code Name Verity by Elizabeth Wein is the best book I've read this year. Set during WW2, Julie is a British (well, Scottish) spy captured in Occupied France. She writes her confession, which is what we're reading, of how she, and the pilot Maddie, met, became friends, were trained for the war effort, and came to be in France. It is a story that is just amazing. It's twisty and touching and wonderful!! Watching as the relationship develops between the two women is great. Julie is charming and funny and brave and so damn smart while Maddie is also smart on completely different subjects, and loyal and strong. I will say that even though the text is written as a first-person confession there is a resolution; the reader isn't just left hanging. The structure is just brilliant and the events are not typical YA; these girls aren't angsting over things. I don't know why this book is in the YA section but, regardless, it is really fabulous and worth the read. Want some proof? It was one of the Printz Honor books, was on the Carnegie shortlist and won the Edgar Allen Poe award for Best YA Novel. "It's like being in love, discovering your best friend"
I really need to try this one again. I crapped out on page 75. The beginning is a bit slow. I think one of the things that intrigued me early on was that i realized that Julie had the potential to be the most unreliable narrator ever! So for much of the book I both wanted to believe her and wanted to figure out if she was lying. I'm finishing things too quickly!